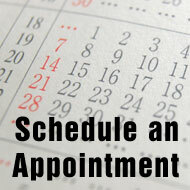 Schedule your appointment here. Simply fill out the form below completely and your appointment will automatically be made for you! We will call you or e-mail with confirmation on your appointment. Thank you!